Turn your "doodles" into stories! Storytelling encourages creative writing and practice of written language. 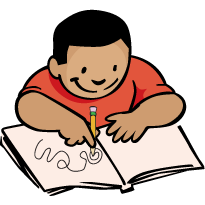 It also helps children learn how to write clear sentences and paragraphs that develop a central idea, and how to be thoughtful about the audience and purpose of written material. And because this activity requires teamwork, children will have to clearly describe their ideas and work to refine those ideas in order to synthesize their peers’ thoughts with their own in the final product. Cut pieces of copy paper into quarters (5.5″ x 4.25″ rectangles) so that each student will have one piece. Pens, pencils, markers, crayons, etc. Ask your students if they’ve ever made little “doodles” on paper. A “doodle” is a small design or drawing that people often make on a piece of paper while they are thinking about something or listening to something. Doodles aren’t meant to be really good, artistic drawings—they are simply quick little expressions. If any students have made doodles before, what are some of the things they usually draw? Can you write a story about the doodles you see? Hand out a piece of the paper you cut and a pen or a pencil to each student. Tell students that at the count of 3, they will have 1 minute to make a doodle—this is just a quick drawing of any design, object, person—anything they can think of drawing. Count to 3 and let them draw. When 1 minute is up, tell the students to put their pencils down, fold their drawings in half and bring them to you. Place the drawings in a bowl (or box, hat, etc.) and have students randomly select a doodle from the lot. Most likely they’ll have a new doodle – if they happened to select their own, that’s OK.
Divide the class into teams of 3 and give them the challenge—they must now write a story as a team that uses the 3 characters or things that are represented by the doodles they have. Set them off to start writing. After 5–10 minutes, ask teams to stop working, and gather everyone together to talk about their process so far. What has been hard about creating their story? What has been easy? Do any teams have suggestions for the others about how to work well together or how to use the characters from the doodles? Have teams return to their stories to complete them. When the stories are done, you have many options. You could have teams read the stories to each other, you could challenge them to act out their stories and/or you could have them illustrate the stories and post them or pass them around to each other. Try doing this same activity with new topics…the options are endless!